I think we can all agree that wearing a dress in the winter can be cold. If you have a winter wedding you’re attending, or just want to stay warm in a dress at church on Sunday, try these tips for wearing a dress in the winter. Over the last few months I’ve received tons of questions about wearing dresses during the winter. The issue for me is that in Southern California we don’t have much winter weather. Our low is maybe 40 degrees, so obviously those of you with weather in the single digits, or even below freezing, will have much different outfit requirements. 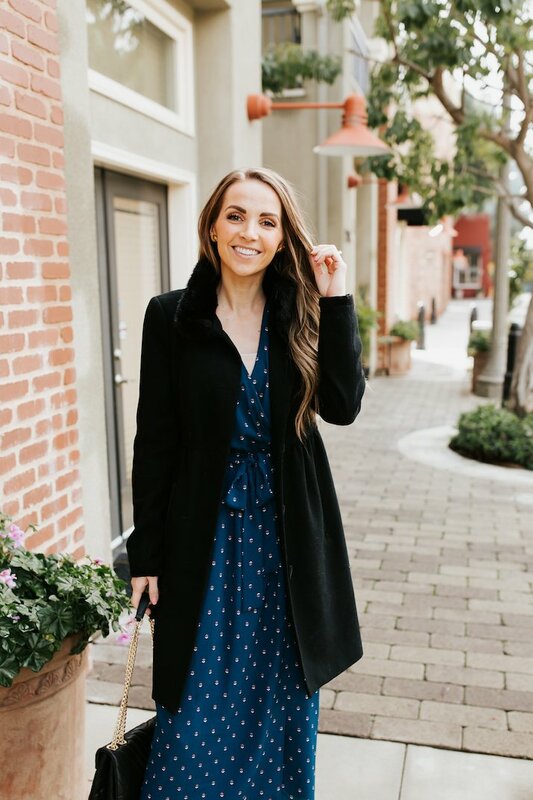 But for those in less extreme weather situations, I wanted to share a few outfit ideas for wearing dresses in the winter — specifically for church, or winter weddings. 1. Invest in a dress coat. 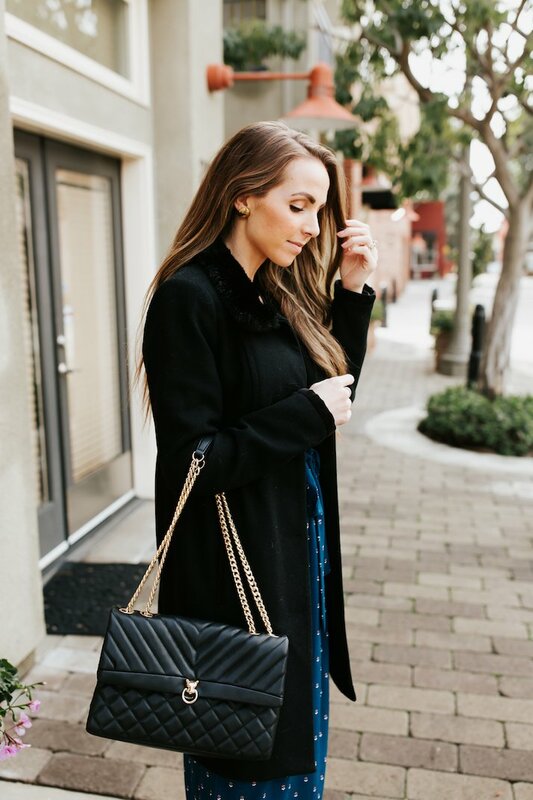 A fur coat, a thick wool coat, or some other kind of dressy, warm coat is an absolute essential. You want something that matches the dressiness level of your dress. 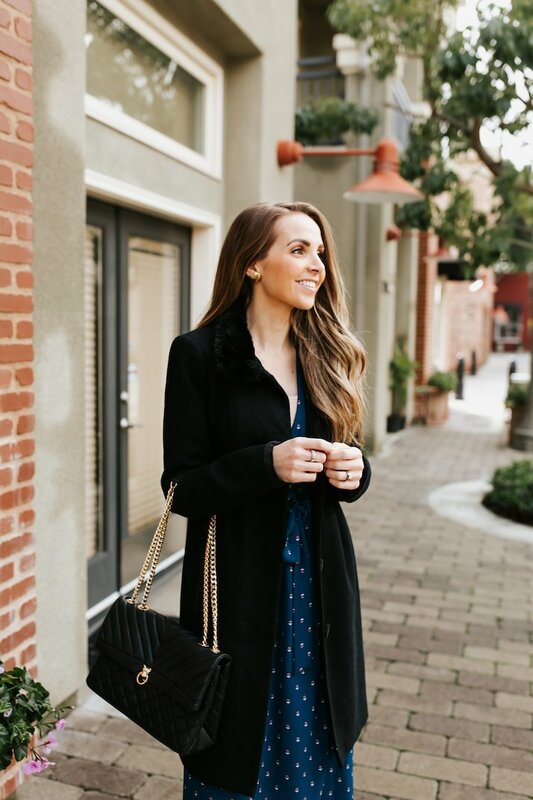 I’ve had this black coat with a faux fur collar for probably ten years and it’s always my go-to for dressy events in the winter. THIS ONE is super similar! The cinched waist helps keep a feminine silhouette, even while wearing a thick, warm coat. So make sure that you find one with a tie waist, darts, or a fit and flare silhouette. 2. Tights will be your best friend. I’m obviously not wearing tights here, but if you’re in really cold weather, a good pair of thick black tights is a great layer under dresses and skirts to keep those legs warm. When we lived in Utah and we got intense winters, I would sometimes wear a pair of black leggings underneath my tights just for an extra layer. You couldn’t tell as long as you wore boots tall enough to hide the hem of the leggings. 3. Try different styles of boots. In this outfit I wore a SOCK BOOTIE, which comes up higher on your calf and has a fitted shaft. I wouldn’t really recommend this style with tights. 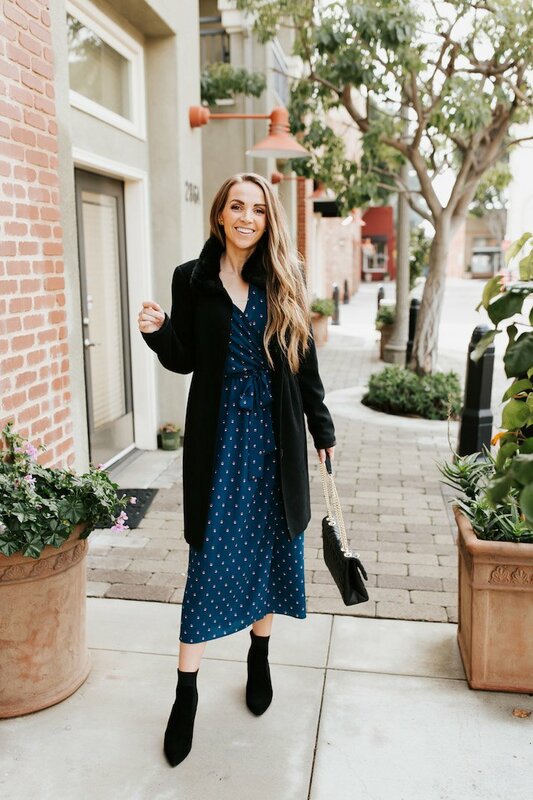 You can absolutely wear knee high boots or even over the knee boots underneath a midi dress — just make sure the boots are pretty fitted so your legs and ankles don’t look bulky right below your hemline. My favorite winter look is a fit and flare knee length dress or A-line skirt with black tights and BLOCK HEEL ANKLE BOOTS. Do you have any other tips for wearing dresses in the winter and staying warm? Share them in the comments!